On Monday I sat the VCAP-DCD 5 beta exam. I thought I would write my experience of preparing and taking the exam, but there is actually not much to write about that is different from my VCAP-DCD 4 experience. For version 4 I prepared for about month, including Design course, this time during two evenings I just reviewed the vSphere 5 Design course manual. It was a beta exam which usually means long and with errors: 131 questions, 4+ hours. Couple questions were missing some words, in one particular question it seemed important. I had also a crash after two hours, but the examination lady restarted the program and fortunately all of my 80+ answers were there intact. I rushed through the exam as quickly as possible, did not read the lengthy scenarios, concentrated on the important points that were asked for and skipped the 5 Visio type questions to do at the end and I still had only an hour to do those. The Visios seemed to be same or very similar as in previous version so they did not take me so much time and I finished about 10 minutes early. The exam questions seemed much the same as in version 4, only a few related to the new vSphere 5 features. Based on that my recommended study path would be: read all the whitepapers about vSphere 5 (What’s new and best practices) and the design methodology from the Design course and you should ace the exam. If you pass the exam and you are not VCP5 you get VCP5 automatically. I obviously do not know my result yet. I am still waiting (more than 2 months) for the result from my other beta exam (VCP5-DT) so I do not expect it to arrive any time soon. I feel spending 4+ hours for something that is less than 10% different from the previous exam is not very effective. I wish there would be a shorter web only delta exam or better some kind of continuous training requirement (online webex courses) similar to PMI Project Management Professional certificaton re-examination which requires collection of certain amount of points during 3 year time period to keep the certification. The points are awarded by taking official courses, online courses, writing a blog or for the actual on the job experience. Today I have taken and passed the VMware Certified Advanced Professional – Datacenter Design (VCAP-DCD) exam with a score of 427 out of 500. I want to describe not only my experience from the exam but also how I prepared for it. When studying or taking an exam I always look for blog posts of other people who already took the exam to learn from their experiences so this is my way to help the others. VMware publishes an exam blueprint guide that describes the exam, recommends training courses and lists the exam topics with relevant documentation. For VCAP-DCD there are two recommended courses. 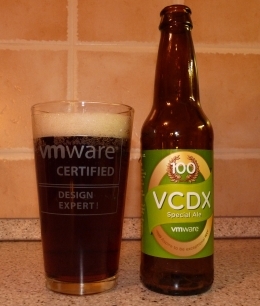 The VMware vSphere Design Workshop which I attended in January and described my experience here: https://fojta.wordpress.com/2011/01/29/vmware-vsphere-design-workshop/. In my opinion the student manual from this course is very valuable for the exam. Although the course is related to vSphere 4.0 and the exam is 4.1 many questions were related to topics from the course (design methodology, terms, best practices). Another recommended course is e-learning training DRBC Design – Disaster Recovery and Business Continuity Fundamentals. It is free for VMware partners. It takes about 3 hours and discusses in general terms disaster recovery concepts and how they map to VMware products. It is interesting course but for the exam is not essential. 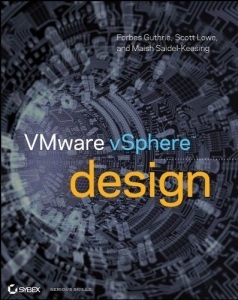 Scott Lowe’s book VMware vSphere Design gives very good overview of all design best practices and also the reasons behind them. 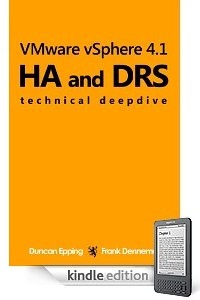 Duncan Epping and Frank Denneman’s HA and DRS Technical Deepdive is brief but very informative book about HA and DRS. For the exam it is too deep dive but on the other hand it helps to understand the reasons behind recommendations and best practices. There were a few questions related to HA and DRS and anybody who read the book can get these right easily. There are 5 questions that require to draw the design with Visio-like tool. These have very long description and take a lot of time just to place all the elements on the drawing board and then to connect them. I wonder how these questions are scored. Each can easily take 15 minutes of your time. There are many drag and drop questions. These also tak more time to answer then regular multiple choice questions. Because of all the different type of questions it is very difficult to plan and manage your time. I definitelly recommend taking a break during the exam however a strategy to skip the time consuming questions is hard to recommend as it is not known how they are scored. My overall impression of this exam is that it is a difficult one. It helps to study for it but just reading books or white papers is not enough. One has to have a good experience in making decisions based on given design requirements. It helps to read virtualization blogs and to have experience with networking and storage. The exam format makes it impossible to cheat with braindumps so my guess there will not be many VCAP-DCD certified people as is the case with VCP.